Steve Wozniak, a.k.a. "The Woz"
Steven Gary Wozniak (born August 11, 1950) is an American computer engineer. He is often referred to as "The Woz". He is from San Jose, California. In the 1970s, he and Steve Jobs founded Apple Inc.. Wozniak designed the Apple I and Apple II computers. Wozniak left Apple in the 1980s, but still owns Apple stock. He has founded several other Silicon Valley companies. Wozniak holds the patent for the microcomputer. Steve Wozniak was born on August 11, 1950 in San Jose, California. He is the son of Jerry Wozniak and Margaret Kern. His father was an engineer at Lockheed Martin. Wozniak is of Polish, German, English and Irish ancestry. His father was from Bukovyna, Ukraine (Poland at the time). The family emigrated to the United States. He grew up with a strong interest in electronics. He experimented by making his own devices such as a voltmeter, ham radio and electronic games. School, however, bored him. He flunked out at the University of Colorado. He then enrolled at the University of California. In 1971, he and Steve Jobs met while working on a mainframe computer at Hewlett-Packard (HP). Like Wozniak, Jobs was interested in electronics and both hated school. Wozniak dropped out of the University of California. Wozniak and Jobs worked out of a family garage on developing a personal computer the average person could use. Wozniak worked on the designing and building the machines while Jobs worked on marketing the computers. In 1976 they founded the company called Apple Inc.. But Wozniak was working for Hewlett-Packard at the time. As a condition of his employment he had signed an Intellectual property agreement. This meant that anything he invented was the property of Hewlett-Packard. But HP was not interested in his "Apple I" computer invention which left him free to do what he wanted with it. They began selling Apple I computers that same year. In 1977, they made their second computer called the Apple II which was very successful. They went on to produce the Apple III. But the The Apple I, II and III computers were text-based machines. Jobs wanted to invent something completely new. The two were working on a new computer they called the Apple Lisa. Jobs made a deal with Xerox who then owned PARC, the Palo Alto Research Center. In return for three days access to PARC, Xerox could buy 100,000 shares of Apple stock for $10 each. Wozniak and Jobs were amazed at what they saw at PARC. Xerox had built a computer called the Xerox Alto but had not marketed it. The Alto had a Graphical user interface instead of being simply text-based. It used a computer mouse to point and click on objects on the computer's screen. Jobs decided all Apple computers from that time on would use a mouse. In 1985, Wozniak left Apple and sold most of his stock. He remained an Apple employee and still received an annual salary. He returned to the University of California, Berkeley in 1986 to complete his degree in electrical engineering. He also started a number of other projects. These include starting CL 9, which created a universal remote control. Wozniak founded]] Wheels of Zeus which developed wireless GPS-enabled products. He joined the board of directors of Danger Inc. which produces mobile computing hardware and software. He also spent a few years teaching grade school. In 1985, US President Ronald Reagan presented Wozniak (with Steve Jobs) the National Medal of Technology. In December 1989, he received an honorary Doctor of Engineering degree from the University of Colorado at Boulder, where he studied in the late sixties. 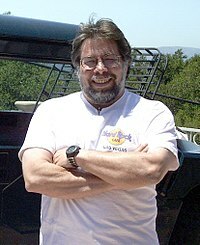 Later he donated funds to create the "Woz Lab" at the University of Colorado at Boulder. In 1997, the Computer History Museum named him one of its Fellows. Wozniak was a key contributor and benefactor to the Children's Discovery Museum of San Jose; the street in front of the museum has been renamed Woz Way in his honor. In September 2000, Wozniak was inducted into the National Inventors Hall of Fame. In 2001 he was awarded the 7th Annual Heinz Award for Technology, the Economy and Employment. The American Humanist Association awarded him the Isaac Asimov Science Award in 2011. In December 2005, Kettering University gave Wozniak an honorary Doctor of Engineering degree He also received an honorary degrees from North Carolina State University, Nova Southeastern University, and the Telluride Tech Festival Award of Technology. In May 2011, Michigan State University gave Wozniak an honorary Doctor of Engineering degree. On June 22, 2011, he was awarded an honorary degree at Concordia University in Montreal, Canada. ↑ 1.0 1.1 1.2 1.3 1.4 1.5 1.6 "Steve Wozniak Biography". bio. A&E Television Networks, LLC. Retrieved January 30, 2017. ↑ 2.0 2.1 2.2 2.3 2.4 2.5 2.6 2.7 "Steve Wozniak Biography". The Famous People. Retrieved January 30, 2017. ↑ RootsWeb's WorldConnect Project: Dowling Family Genealogy. Wc.rootsweb.ancestry.com (December 28, 1925). Retrieved on August 24, 2013. ↑ "Letters-General Questions Answered". Woz.org. March 1, 2000. Retrieved February 6, 2012. ↑ 5.0 5.1 5.2 5.3 5.4 Nik Rawlinson (April 1, 2016). "History of Apple, 1976-2016: The story of Steve Jobs and the company he founded". Macworld. IDG.UK. Retrieved January 30, 2017. ↑ 6.0 6.1 6.2 6.3 6.4 6.5 6.6 Madeline Stone (August 11, 2015). "The life and times of Apple cofounder Steve Wozniak, who just turned 65". Business Insider Inc. Retrieved January 30, 2017. ↑ Seibold, Chris. "This Day in Apple History December 28, 1989: Woz Gets Honorary Doctorate, Dish Incident Forgotten". Retrieved 2007-07-31. ↑ "maps.google.com". maps.google.com. 1970-01-01. Retrieved 2010-11-11. ↑ Inventor Profile - National Inventors Hall of Fame. ↑ "The Heinz Awards, Steve Wozniak profile". Heinzawards.net. Retrieved 2010-11-11. ↑ Honorary Doctorate - Kettering University List of Honorary Degrees. This page was last changed on 22 February 2017, at 17:09.